Oops! France's François Hollande Confuses China And Japan : The Two-Way Hollande made the mistake standing right next to the Japanese prime minister. Elysée officials said: "He is tired." French President François Hollande is welcomed by Japanese Prime Minister Shinzo Abe prior to their meeting at Abe's official residence in Tokyo. It is as embarrassing a diplomatic gaffe as you can make: French President François Hollande was in the same room as Japanese Prime Minister Shinzo Abe, this morning, when he offered the "Chinese people" condolences for the 10 citizens it lost during the Algerian hostage crisis in January. "Hollande didn't seem to notice the mistake and didn't correct it, carrying on with his speech regardless. He was saved by the interpreter who was doing the simultaneous translation for journalists and into Abe's earpiece, who instantly corrected the gaffe by referring to the "Japanese." 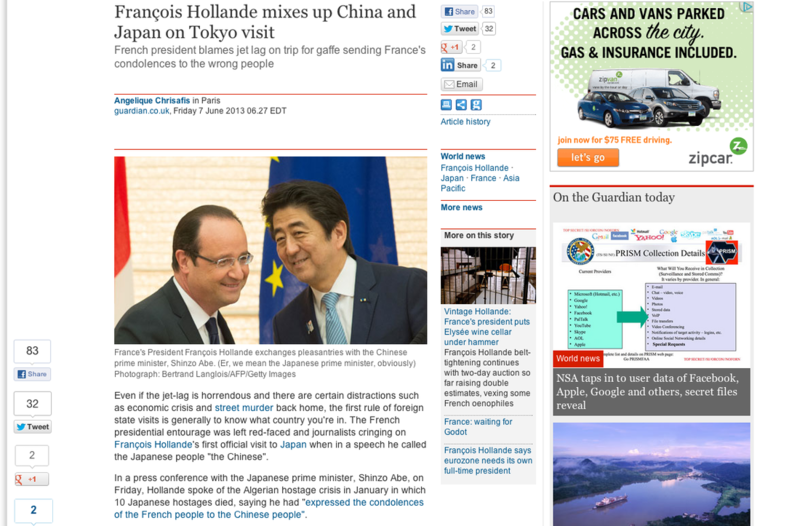 But at least one Japanese journalist who spoke French picked up on the blunder and the French media widely reported it.
" 'He is tired,' was the explanation from Elysée officials to French journalists on the trip." As the BBC explains, Japan and China are not the greatest of friends and "neither side's nationals like to be confused with the other." 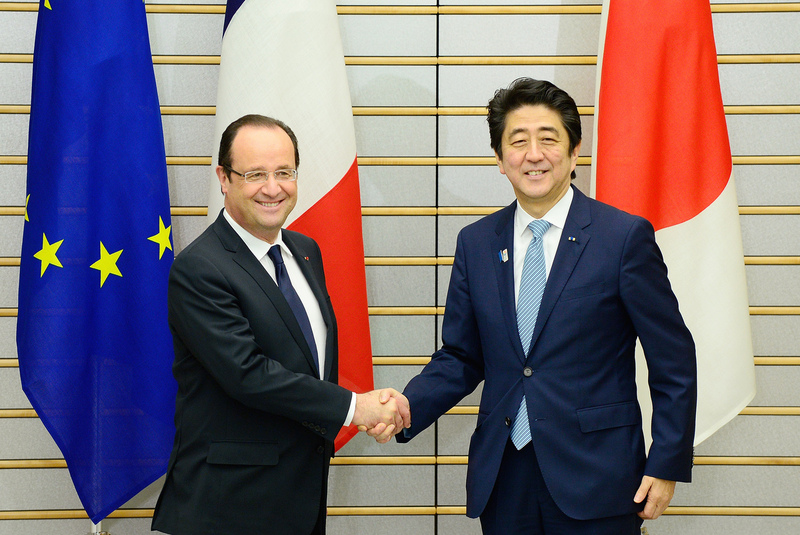 What's more, this was the first French presidential visit to Japan in 17 years. We point this out, knowing full well that a mistake like this is bound to happen to us someday. You know what they say: "But for the grace of God, go I." We now notice that The Guardian was joking!